GPLv2の第2節後半部分 These requirements [...] do not apply to those sections when you distribute them as separate works. GPLv3第5項最終段落 Inclusion of a covered work in an aggregate does not cause this License to apply to the other parts of the aggregate. 'What is the difference between an “aggregate” and other kinds of “modified versions”? Defendant has infringed on the copyright of plaintiff by offering the software 'netfilter/iptables' for download and by advertising its distribution, without adhering to the license conditions of the GPL. Said actions would only be permissible if defendant had a license grant [...] This is independent of the questions whether the licensing conditions of the GPL have been effectively agreed upon between plaintiff and defendant or not. 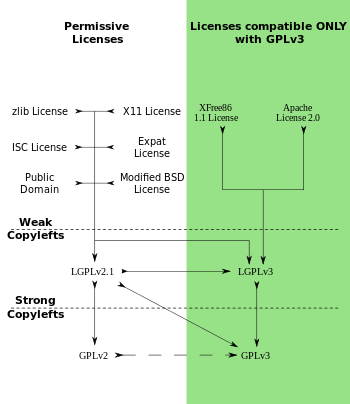 If the GPL were not agreed upon by the parties, defendant would notwithstanding lack the necessary rights to copy, distribute, and make the software 'netfilter/iptables' publicly available. ^ Lewis Galoob Toys, Inc. v. Nintendo of America, Inc.（英語版） , 964 F.2d 965, ¶10 (9th Cir. 1992-05-21). ^ Guadamuz-Gonzalez, Andres (2004). “Viral contracts or unenforceable documents? Contractual validity of copyleft licenses”. European Intellectual Property Review 26 (8): 331–339. http://papers.ssrn.com/sol3/papers.cfm?abstract_id=569101. ^ Chopra, Samir; Dexter, Scott (2007-08-14). Decoding liberation: the promise of free and open source software. Routledge. p. 56. ISBN 0415978939. http://books.google.com/books?id=c7ppFih2mSwC&pg=PT74. ^ Williams, Sam (2002-03). Free as in Freedom: Richard Stallman's Crusade for Free Software. O'Reilly Media. ISBN 0596002874. http://oreilly.com/openbook/freedom/ch02.html.